In June 2018, a few miles off the northern coast of Scotland, a cylinder the size of a shipping container was carefully lowered to the bottom of the ocean floor. Sounds like a clever (if complex) way to bury evidence, or treasure, or something similarly mysterious. But what’s actually inside the undersea capsule are 864 Microsoft servers. The contents themselves, then, aren’t all that enticing—but the details of this incredible project from one of the world’s biggest tech companies are. A lights out data center is one that ups its efficiency and security by limiting human access—without people coming and going, lighting isn’t needed, and climate control is easier. The data centers of the future will increasingly be lights out as technologies like robotics and AI enable them to be managed remotely and autonomously. They’ll also, apparently, be located underwater. Eight of the world’s ten biggest cities are on or near a coastline, and according to Microsoft, half the world’s population lives near the ocean—and that’s just one reason to store data there. Another reason is that getting a storage facility up and running (or, down and bubbling) underwater is much, much faster. Building a datacenter on land has typically taken about two years (though that timeframe is dropping as technology improves); Microsoft claims its deep-sea cylinders will take less than 90 days to go from factory ship to operation. Equally impressive is the fact that the centers will run completely on renewable energy. 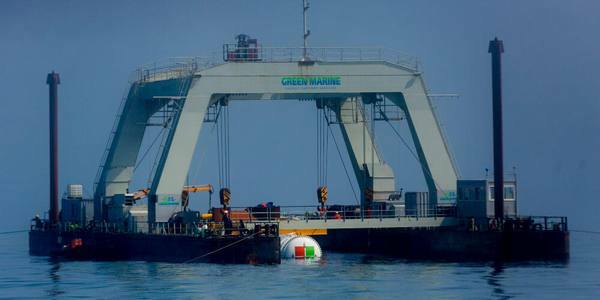 The cylinder that was deployed last week is connected to the electrical grid for Scotland’s Orkney Islands, which is powered by a blend of off-shore tidal generators and on-shore wind and solar power. Microsoft plans to study the possibility of powering future Natick datacenters directly using offshore wind or tidal energy, no grid connection needed. Speaking of energy, Natick cylinders will use a lot less of it than their landlocked counterparts. The vast majority of electricity for datacenters on land is gobbled up by their cooling process. But submersion in the northern ocean’s frigid water provides a constant natural source of cooling, which also makes the servers less likely to overheat and crash. To boot, the cylinders themselves are made from recycled material, and the company plans to re-recycle them at the end of their lifespan. “We aspire to create a sustainable datacenter which leverages locally produced green energy, providing customers with additional options to meet their own sustainability requirements,” Microsoft states. As more of the world’s population comes online, the need for datacenters is going to skyrocket, and having a fast, green solution like this would prove remarkably useful. At less than a week in the water, though, we’ll have to wait and see if Project Natick goes as swimmingly as Microsoft is hoping it will.